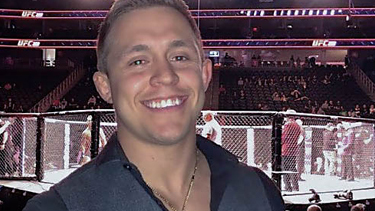 LAS VEGAS – Derek Garcia, a second-year law student at UNM School of Law, achieved his dreams of working in the area of sports and entertainment law. Garcia recently accepted an internship position at the Ultimate Fighting Championship (UFC) legal department in Las Vegas, Nevada on January 16, 2018. The former Olympic hopeful and world-class collegiate wrestler has earned numerous national wrestling titles. While these are highly respected titles, his most significant goal has always been to take the fight to a different arena. An area he believed he could make a real impact. Garcia is one of many UNM School of Law students who thrive in the face of competition. Recently, the UNM School of Law’s Mock Trial team litigated their way to the final round of the regional competition, and the Fredrick Douglass Moot Court team will compete at nationals after taking first place in the region. However, Garcia attributes his success to more than his spirited drive and determination—a common characteristic among UNM School of Law students. The UNM School of Law students are some of the best legal fighters in the arena, and these legal fighters pin big opportunities.